The product line of Scorpion compressors is one of the most famous lines of Silentaire Technology. Key features of Scorpion items combine small size, oil-free and almost maintenance-free operation, and automatic shutoff function. To clarify, the auto shutoff feature helps to shorten operating time and eliminate humidity build-up. Thus, this function reduces engine wear. However, the most valuable characteristics are oil-free operation and quietness. Due to these features, you get a powerful, versatile, durable and silent machine. The Scorpion IIW-TT compressor suits any hobby like modeling, painting, body art, etc. It is oilless, practical, and handy. 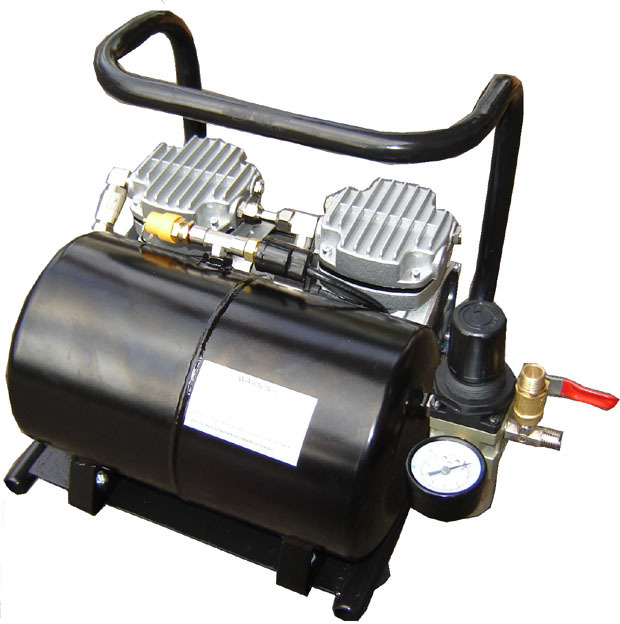 Additionally, this quiet compressor requires little maintenance as it is made of durable materials. Note, that when you don’t operate an airbrush, the auto shutoff switch turns off the motor. It will start running again after you resume the spraying. As a result, the service life of the compressor increases as the automatic shutoff function minimizes overheat and motor wear. Whisper quiet running won’t distract your attention from your artwork so you can enjoy the airbrush painting. The IIW-TT model includes the multi airbrush holder and two air hoses with the universal adaptor for airbrush. *The General User and Maintenance Instructions will help you to assemble the device and operate it properly.